In all the brouhaha around the next attempt by Google to conquer the living room, called Android TV, a little tidbit about a new feature coming to the Chromecast streaming dongle was almost lost. Yes, it's exactly what you were thinking and hoping for - the humble $35 dongle will now be able to mirror whatever is on your Android device's screen straight on the biggest screen in the house. There will be a new button on select Android handsets which will say "Cast screen," and as soon as it's pressed, you will be able to see whatever you are doing on your tiny phone - gaming, watching a movie, reviewing pictures, even the camera app - stretched to your TV, and mirrored pixel by pixel. Awesome news, making the affordable Chromecast an almost unbeatable value when it comes to connecting your Android gear to your TV. The phones that will support this initially are listed as follows: all the Nexus devices (of course), the Galaxy S4/S5/Note 3, LG G2/G2 Pro, and the HTC One. I have the LG G2 and this was the one thing stopping me from getting the chromecast. NOW it's a no brainer. Nice! Guess I won't need "Mirror" anymore! So the "Cast Screen" button will be different than the one that is already in the Setting menu under Display? Nice! Although I do wonder if sending screen data over WiFi when playing a game, will be fast enough to actually play the game on your TV. I play zen pinball regularly and wouldn't like to miss balls because of slow data. Works flawlessly with my 5s and Apple TV, so it shouldn't be a problem with CCast. Maybe it depends which game you play though. Both devices are 802.11n capable, so that shouldn't be the problem. Does Apple TV support the 5 Ghz band? I do know Chromecast doesn't. They showed a live demo in the keynote and it looked practically in sync. Other than the fact that it's an exact copy of Apple TV, you're right, no correlation to the letter i. /endsarc. You are correct, the main difference, hopefully will be, we saved $64. Id pay $64 more for a complete ecosystem than limited ability. I have Chromecast. Both are awesome but Apple TV offers so much more. 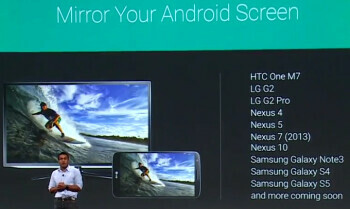 If Chromecast now mirrors your Android phone or tablet. So I can play games or browser, facebook, hangouts, Play all access, and so much more. Then how again does Apple TV offer so much more? Oh wait, that's right it doesn't. Looks like someone got offended from such a general and opinionated post. Geez, fanboys are sprouting faster than weeds this summer. That's not they only thing they'll be aSproutin'! Complete?????? Waste of money maybe! Apple TV; no one I know is dumb enough to use Apple TV. Everyone I know just dl's straight to their phone; oh that's right, you still can't do that unless you dl into iTooones first and then you get an error message. Hah!!!!! Go play with your Apple TV and leave technology to Android. You probably know nothing about Apple TV. I can't stand "streaming" to my TV via my Nexus. I watch all my sh*t straight from my macbook in the zip of a click. Watching my torrented shows and movies from my Macbook is great. Way less hassle than the silly sh*t I need to keep up with. Go stroke your ego somewhere else, tool. Your retardation doesn't work here. Another clueless and butthurt fanboy. So the GS5 is the only 2014 phone that supports screen casting. The "LG G2 Pro" also came out in 2014. Although, it's actually called the LG G Pro 2. I pressed the button on my Nexus 4 and it keeps saying that casting screen failed. It also says that it's a beta feature in parenthesis while you're attempting to cast it. Sorry this comment was not for you. Will there be any new features for chromecast with Apple devices? Tryed with my nexus 7(2013) but didn´t work, gave me an error.